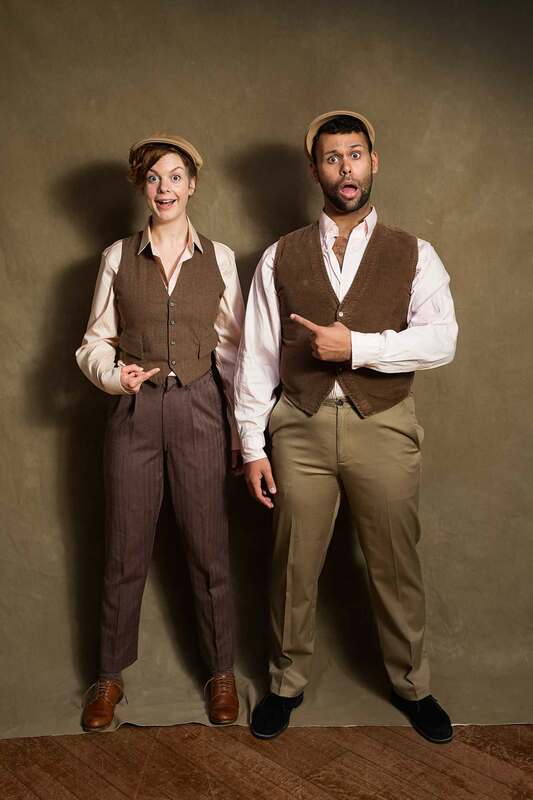 Annabelle Rollison and Topher Embrey in Comedy of Errors. Photo by Lauren Rogers Parker. The American Shakespeare Center (ASC) brings its 2018/19 Hand of Time Tour to Austin with a performance of The Comedy of Errors on Tuesday, March 5 at 7PM on the stage of Hogg Auditorium. In this rollicking farce, Shakespeare elevates Roman comedy to dizzying heights. Two long-separated twins, their two tricky servants (also twins), a jealous wife, and her lovelorn sister romp through this fast-paced comedy. Filled with mistaken identities and slapstick humor, The Comedy of Errors is one of Shakespeare's most widely celebrated comedic gems. Desdemona Chiang is a celebrated stage director based in Seattle and the San Francisco Bay Area. Co-Founder of Azeotrope (Seattle). Directing credits include Oregon Shakespeare Festival, California Shakespeare Theater, Seattle Repertory Theatre, Playmakers Repertory Company, Long Wharf Theatre, and Seattle Children’s Theatre among others. This is her directorial debut at the ASC. More on Chiang can be found at http://www.desdemona.org. The ASC brings a unique performance style to Hogg Auditorium, blending Shakespeare’s stagecraft with modern sensibility. The company uses Shakespeare’s Staging Conditions: universal lighting, minimal sets, character doubling, cross-gender casting, and live music. Shakespeare’s performance company couldn’t turn the lights out on the audience; actors and audience shared the same light. The Hand of Time Tour shares light with the audience throughout the performance for a unique brand of audience contact rarely seen in theatre today. The 2018/19 Hand of Time Tour is the ASC’s 30th annual tour. Founded as Shenandoah Shakespeare Express in 1988, the ASC grew to international prominence and is now the home of the world’s only re-creation of Shakespeare’s indoor theatre in Staunton, VA. ASC on Tour has performed in 46 US states, one US territory, and five other countries. The Hand of Time Tour features Madeline Calais, Hilary Alexa Caldwell, Josh Clark, Topher Embrey, Ally Farzetta, Kenn Hopkins Jr., J.C. Long, Annabelle Rollison, Ronald Román-Meléndez, Constance Swain, and Andrew Tung. Thomas J. Coppola is touring troupe manager. Sophia Beratta is assistant touring troupe manager and understudy. The performance will take place on the UT campus at the Hogg Memorial Auditorium. Parking is available on the street and at UT’s San Antonio Garage. Tickets are $25 and $15 for students, as well as UT faculty and staff. They can be purchased online in advance through the Shakespeare at Winedale website. The theater will open for seating at 7:00 pm. At this time, live pre-show music will also begin. The performance will begin at 7:30 pm. Seats for the performances are available on a first-come, first-served basis, so audience members are encouraged to arrive early, take their seats, and enjoy the music. This visit is made possible by Shakespeare at Winedale, the English Department, the Iris Howards Regents Professorship, and the Mary Lu Joynes Endowment in the Plan II Honors Program.